"My name is Neil Clarke. I am the owner of Audionautics GmbH. We are a small Swiss company based in Luzern. 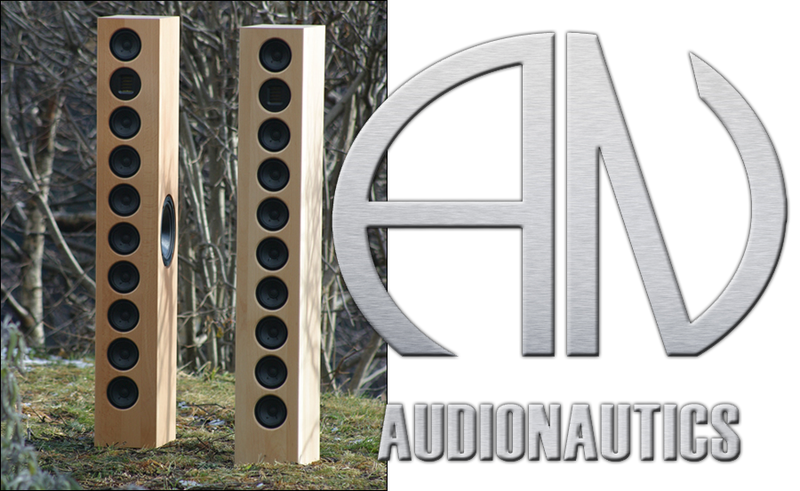 We specialize in the manufacture of real wood loudspeakers. We currently have one model, the S-Series. That is a 3-way floorstander which combines a single AMT with an array of 9 mids and a single woofer. We plan to release a smaller brother later this year. We'd love for you to review the S-Series. I understand you are in Switzerland, canton of Vaud. It would be no problem and a great pleasure to personally deliver a pair at your convenience." And so I was introduced to not just another brand in our small but industrious nation but yet another domestic speaker maker who promotes solid wood. Hello Boenicke and soundkaos. There must be something to our Alpine air and clean water which just cries out for organic wood, not composites or the ubiquitous saw dust set in glue called MDF. Applying the 3.5" Ø of our nine paralleled midranges which form a classic line source to some guess work on size easily works out the fact that this must be one compact speaker. In fact, it's all of a meter tall by 15cm wide and 22cm deep. Despite the 19mm Beech, this adds to a mere 13kg of fighting weight. In the same vein, the unopposed lateral woofer is just a 6.5". Response nets a claimed 38Hz-20kHz and efficiency as likely determined by that lone woofer is a standard 88dB. All this begged a number of questions starting with that odd name. Why S-Series? Wasn't this a singular model, not entire range? Mating a line-source array of small mids to a folded tweeter made sense. The latter's surface area readily eclipses nine conventional 1-inch dome tweeters. But, does it copy our vertical midrange's dispersion pattern whose compound cone area equals a single very elongated 13-incher? It's why Anthony Gallo's big line source alternated mids and tweeter; why Aurelia's top model paralleled three 1-inch dome tweeters in shallow waveguides or Scaena paralleled their mid/woofer pod array with stacked planar tweeters. Finally, given the multitude of 3.5" mids, why only a single woofer of such small size? Why not at least a standard force-cancelling pair of horizontally opposed woofers, multiple pairs or something bigger in the first place? Multiple bass units would drive up the efficiency rating. Plus, with such tall proportions vs. a small footprint with no outriggers, didn't a single sidefiring woofer cause undesirable asymmetrical torquing on the cabinet? Neither a fixed plinth nor footers adjustable from above also meant that the all-important floor gap for the downfiring port's radiation resistance was left to fiddling with obscured spikes. With a delivery by the designer, I of course had the perfect op to sort all of this out in person. But first, some basics. An economist might wonder why nine cheaper drivers instead of three dearer ones or one really posh unit. 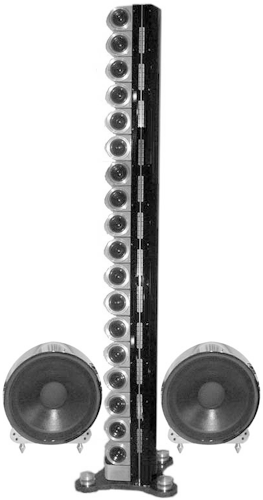 The line-source answer is that spreading the work load over multiple units hence motors and suspensions reduces each driver's excursions, thus benefits speed and linearity and the reduction of distortion. Additionally, a long vertical driver emits a cylindrical not spherical wave front. And that suffers less amplitude loss over distance to maximize amplifier power. It's why our three line-source samples apply the same principle also to their tweeters. In your chair a few meters off, you'd not want their HF energy to fall off more rapidly than the rest.